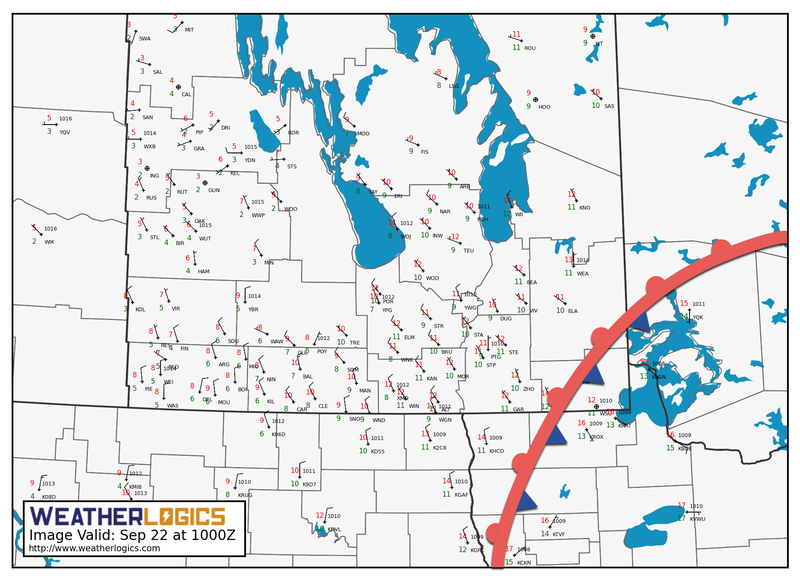 A developing Colorado Low has brought very humid conditions to Manitoba’s doorstep, and a disturbance moving through the province today will tap into that moisture and spread showers and thunderstorms across the Red River Valley into the southeastern corner of the Province. An upper-level disturbance moving through the province will bring a late-season thunderstorm risk to the Red River Valley with a small risk of severe storms. There’s a surprising amount of support for thunderstorms, largely due to the building humidity in Minnesota over the past few days. While the weather in Winnipeg is cool and dry, conditions have become positively balmy in Minnesota, where there are overnight lows in the 20s thanks to sticky dew points in the 20-22°C range. A stationary front lies across northern Minnesota and far southeastern Manitoba this morning. The dry air over the Red River Valley is separated from the muggy Minnesota conditions by a fairly strong frontal boundary running from Nebraska northeastwards through Minnesota and into northwestern Ontario. 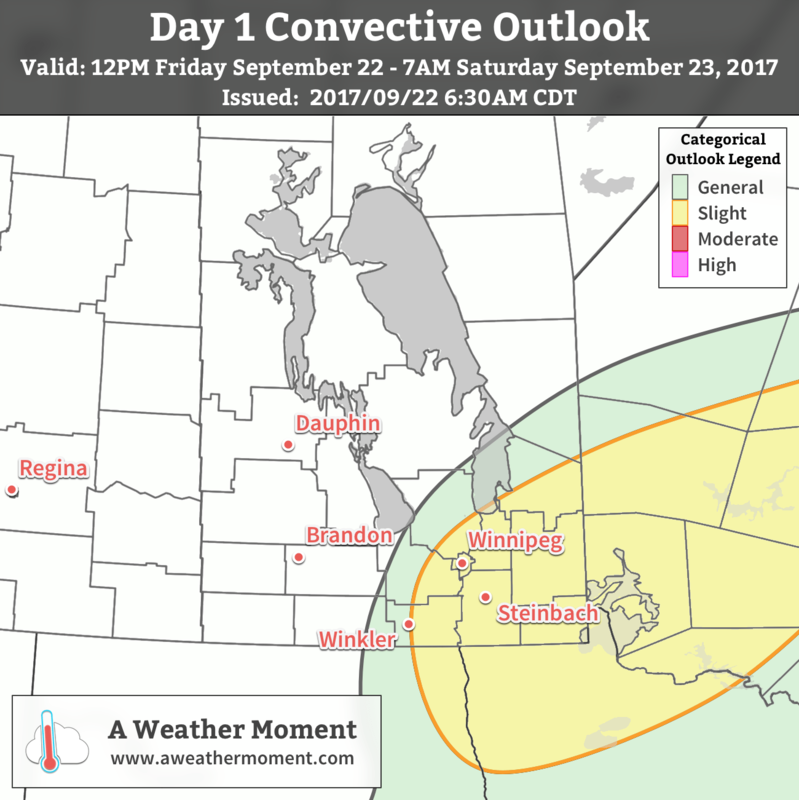 As an upper-level disturbance approaches today, that humid air will be lifted up over the front and into southern Manitoba. So while we won’t see particularly humid conditions here at ground-level, further up in the atmosphere will see significant moisture move in. Before the weather gets busier this afternoon, temperatures will climb to a high near 18°C, but winds will be breezy, increasing out of the northeast to 30 gusting to 50 km/h. The rain and thunderstorms will move out of the region this evening. When all is said and done, most areas will have seen somewhere between 5-10 mm of rain, with amounts of 20-40 mm possible in areas that see more thunderstorm activity. Skies will remain fairly cloudy tonight as temperatures dip to a low near 10°C with winds diminishing to around 20 km/h. Things calm down for Saturday as the region sees a lull between Friday’s disturbance and another system moving on for Sunday. Expect mostly cloudy skies, a high near 16°C, and winds out of the north at around 20 km/h. Skies will remain cloudy on Saturday night with a low near 10°C again. A Colorado Low will progress through the region on Sunday, bringing rainy conditions to much of Southern Manitoba. Unfortunately at this time, it’s not quite clear exactly how rainy things will be. Some guidance has this system a bit more progressive and tracking further eastwards, which would result in 5-15 mm of rain in the Red River Valley, but others — such as the GDPS shown above — are slower with the system and bring it further west. The slower solutions would result in higher rainfall amounts for the region, more likely in the 15-30 mm range with localized spots perhaps seeing 40 mm. At this point, the lower rainfall solution seems most likely, but we’ll be keeping an eye on it. Otherwise, it will be a cool day with a high of just 12°C and more northerly winds around 30 km/h. Expect a cloudy low near 9°C on Sunday night. 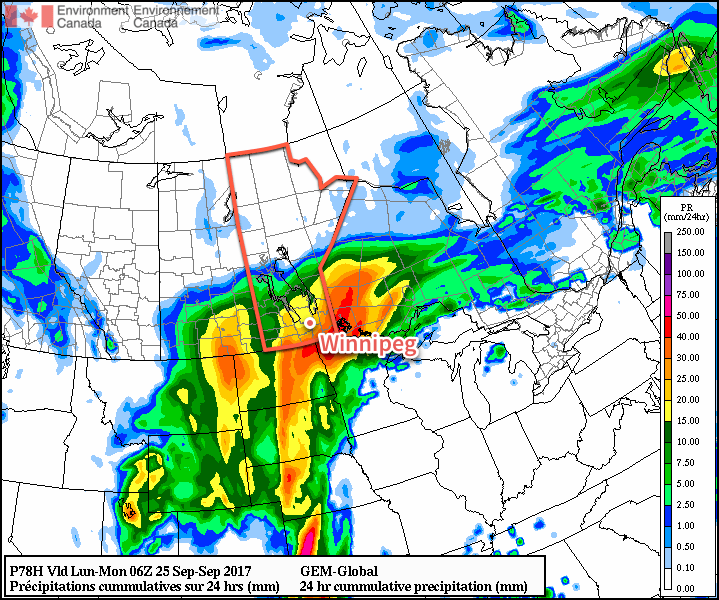 Cloudy and cool conditions are expected to persist into the beginning of next week, but Winnipeg will likely be done with any significant rainfall chances. By mid-week, it looks like things will clear out with temperatures returning to seasonal values. The more pleasant weather may continue through next weekend, which would be a nice change! Winnipeg’s seasonal daytime high is currently 16°C while the seasonal overnight low is 4°C.